…and I am a Tetris addict. I visit the Tetris Friends website as one of my first on-computer activities each morning (I have to rack up my bonus points every day for visiting…) and I usually play ‘one last game’ before I head off to bed each night. I’m merciless when going head to head with my kids (yes, they’re hooked, too!) and my take-no-prisoners attitude has be the source of more than one harumph out of the living room by one of the aforementioned kidlets. Or maybe it was my touchdown dance in the living room that encouraged their retreat to their bedroom? Maybe a whole pattern book of these? 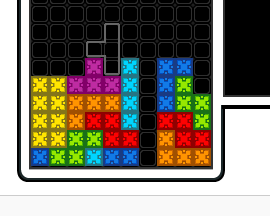 I tell myself that my time with Tetris enhances my spacial skills and allows me to be a better designer. I pretend that I use Tetris as a jumping off point for designs. But I’m just kidding myself. I dream about slipping the “T” into the slot to create a spin, and I watch replays of the highest ranked games on the leaderboard. I’m hooked, baby. This entry was posted in Games, Philosophical by Annie. Bookmark the permalink. I also used to be a Tetris addict…. untl I discovered Boxikon. It’s a lot like Tetris, as you fit the pieces together to make lines, but you get to pick which piece you can fit in. I play it on my iPod touch it may be available in other formats as well. Give it a try ! Warning, Annie, fellow Virgo — Tetris is awesome, but DO NOT try Plants vs. Zombies, unless you feel you need an addiction that will take up every spare moment of any free time you might ever have! Can you see it…? little crocheted granny squares. In the Tetris colors. Sewn together in the Tetris shapes, filling the bottom third of a vest. Top two thirds being made of black squares. Just off-center on the back, one shape placed to appear to be “dropping down” through the black squares towards the bottom. I suppose you’d have trademark issues with *calling* it a Tetris vest, but I. could. so. totally. see that as a pattern worked up in crochet granny squares. I used to be a Tetris addict (or maybe I should say I’m currently “in Tetris recovery.” But I had to quit cold turkey when it started to cause major wrist and thumb pain. Given the choice of knitting or playing, I chose knitting….. so far I am recovering….. but then I read a post like this and start thinking…… maybe just one game? There are studies of the possible use of Tetris for treatment of post-traumatic stress and chronic pain. 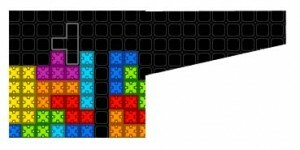 So, playing Tetris may be good for your health, physical and mental. I remember we would drive home every day and I could still see the bricks falling in my mind. Happy New Year to you Annie and to your lovely family. Thank you for your amazing knitting designs! Thank you for your blogging.